Autumn is coming, and girls, make a resolution not to fall into the grey, drab uniform of dreary coats this autumn and winter. Autumn is an exciting time of the year, there are so many autumn jewel colours. Deep reds and golds, purples and oranges, so many vibrant colours, perfect for elegant, stylish vintage clothing. Oh, it's just so nice to be able to look forward to lovely autumn foods, the rich casseroles and soups, and a lovely evening by the fire, and of course, you can always have your hot chocolate, girls! Vintage clothing is smart, elegant and inspiring. It is not a dull, dreary, grey hoodie, which steals away your individual personality. Your big buy this autumn could be a lovely vintage style coat. A coat like this will lend itself perfectly to vibrant vintage scarves, vintage brooches, necklaces and earrings, and of course a delightful cloche hat. 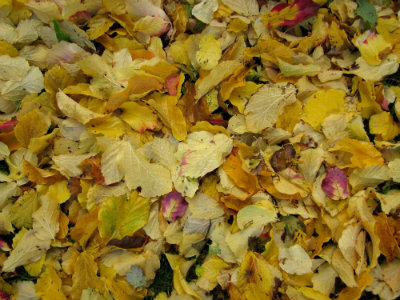 Decide which rich autumn colour best flatters you. For those with dark hair, rich dramatic reds and browns are great, while gorgeous blues and greys are perfect for those with fair hair. For those lucky enough to have auburn hair, there are delightful shades of green, but red can also look quite fantastic. A good tailored coat with style and glamour will take you to any occasion throughout all of the autumn and the winter too – even at Christmas. Once you have worn a really lovely vintage style coat, with a glamorous scarf and a sparkly brooch, you will never fall back into the grey blob of uniformity. Now that the nights are drawing in you need sparkle! It is not just for Christmas, though that will soon be upon us. Sparkle adds a touch of happiness and glamour to our lives, girls. So look out at vintage fairs, and Vintassion online, for lovely sparkly vintage brooches, necklaces and earrings to wear with your new vintage style autumn coat and dress. Pearls are in this autumn, and there are some fantastic vintage pearls to be found both at upcoming vintage fairs and on Vintassion. 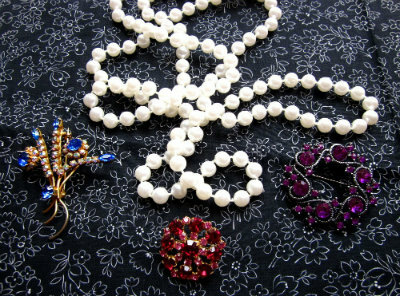 Try a long string of pearls wound several times around your neck, or tied in a loop. With a little bit of imagination there are so many ways to wear a long string of pearls. Vintage scarves glow with vibrant colours that you simply cannot find in modern scarves. 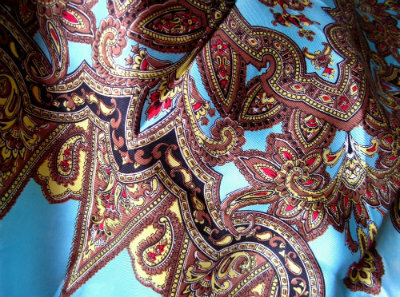 If you are lucky enough to find a vintage scarf, you will appreciate the silky warmth and glamour it gives you. 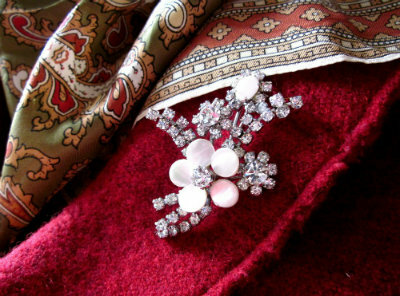 A vintage scarf can completely make an autumn or winter outfit. Complement and enhance your vintage style coat or dress with a vintage scarf, it will add that perfect finishing touch of style, echoing the rich colours of the autumn leaves. Even though the hazy warmth of summer has gone, and it’s beginning to feel cold, and the nights are drawing in, don't be nostalgic for summer. Seek out vintage this autumn to wear. Enjoy all the autumn colours of nature while you're having lovely days out going to vintage fairs, let the colours inspire your vintage style autumn clothing. Welcome autumn, look for the lovely colours, the rich golds and crimsons of the leaves, and the opportunity to buy comforting stylish vintage clothes, that echo the rich autumn colours.